Hands up who doesn’t have enough time in the morning? That will be most of us then! Getting ready for college or work is difficult enough when you’re still sleepy in the mornings – even more so if you have a family or if you work odd hours. Perfecting the morning routine can be considered a bit of an art in itself, as there’s often so much to do before you even step out of the door. Plus, the last thing you want to do is be stressed before you’ve even got to work – so just how do you go about creating a workable morning routine? Rushing around like a mad woman in a morning is never a good way to start the day. If you are stressed in the mornings, it is likely that you will continue to feel that way throughout the rest of the day, and it could affect later decisions that you make. Try and set the tone for the day by making sure you have enough time to get everything done. Yes, this might mean setting your alarm a little earlier. Those anti-morning people among us will be recoiling in horror – but it doesn’t need to be drastic. If you really should be out of bed by 7.30am, try setting your alarm half an hour before that. This way, it gives you chance to press snooze a couple of times, and spend a few minutes lounging around on your phone before you commit to getting up. Being able to take things slower in the mornings will make a huge difference to the rest of your day, and you are also more likely to be more organised this way too. You probably spend much of your mornings in your bathroom, getting ready for the day. Around this time of year, when the weather is cold, it can be very tempting to stand for ages in a hot shower. But when you’re on limited time, enjoying your shower too much can only make you late. There is a time and a place for hour-long baths and showers – unfortunately, the morning is not it! Organise your bathroom so that it becomes efficient for you and serves a purpose. For example, no one wants to be messing around with getting the perfect water temperature when they’re in a rush. So, consider trying a thermostatic bath shower mixer so you can turn it on and get straight in. We’ve all seen dreamy Instagram posts of fitness gurus managing to fit in eggs, toast, avocado, parma ham and cherry tomatoes on their breakfast plate before work. Whilst this is a healthy breakfast, it’s certainly not one for those short on time. There’s no harm in preparing a delicious brunch on a weekend, but during the week, you may need something more practical. However, you can still be healthy. 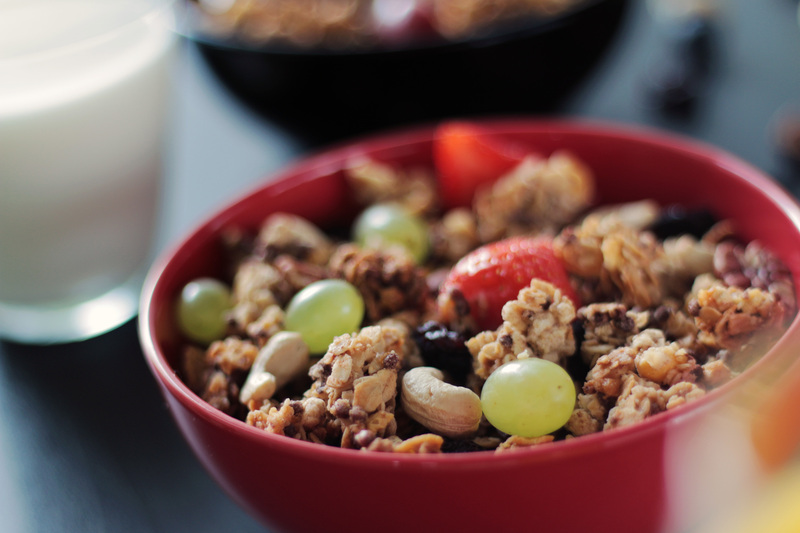 A high fibre bowl of cereal with nuts and berries is a great way to start the day, and you could even try overnight oats if you want to fill up on protein.